Guitarist issue 350 - on sale now! Guitarist delves into the murky world of the tribute act, and find out what it's like to get paid to not only emulate your heroes, but to play huge venues doing it! PLUS! We give you the lowdown on four rigs that you can assemble today if you want to emulate four of the greatest guitar heroes of them all - Jimmy Hendrix, David Gilmour, Jimmy Page and Eddie Van Halen. The US guitar god talks about guitar philosophy and having a new record under his belt. A name and shape that barely made it off the drawing board in the 1960s, brought back from the dead. But is it any good this time? Guitarist issue 350, is available now from all good UK newsagents. Non-UK readers can purchase a copy from www.myfavouritemagazines.co.uk, or UK readers can subscribe and receive a free gift! Guitarist Deluxe - the fully-enhanced interactive edition of Guitarist, Guitarist Deluxe is available now for iPad. Guitarist Deluxe has all the same great content as the print version, enhanced with embedded video, audio, extra image galleries and more! To download the container app from Apple Newsstand, please click here. (Teaser Edition is free, further issues cost £3.99 each via in-app purchasing, subscriptions are also available). 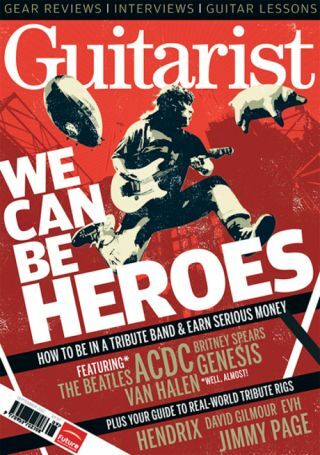 In addition, Guitarist is available in non-enhanced form from Newsstand, compatible with iPhone and iPad devices (iOS5 required), and also as a digital magazine for PC, Mac, iOS and Android from Zinio.